Although I was supposed to work on a project with the electrical gang today, I slept in and chatted with Ella instead. It's not like I carry the weight of the station on my shoulders, so I probably wasn't missed. Later in the afternoon I started scanning through my games and realized that I hadn't played Civilization in quite a while. So, I downloaded the latest patch, reinstalled the game, and played until I lost track of time. I can't recall the last time I've gotten so preoccupied with something so insignificant. I kept telling myself that I would play "just one more turn" until 1:00 in the morning, and was slightly upset that I had to break for dinner. Had problems waking up at my normal time (duh!) and didn't report to the Science Support Center (SSC) project until after nine. And, as I expected, no big deal to them. If I'm there to help out, great. If not, no loss. Although I feel sort of bad for not keeping regular working hours, I force myself to remember that I'm not getting paid for my efforts. I'm just there for the work experience plus all the cuts, bruises, and jolts that come with it. There was not a hint of wind today. Consequently, it felt much warmer, almost like a winter day in New England... mid twenties or so. But underestimating the weather can be disastrous. It was much colder than that ( I found out later that it was in the - 30s). Although I didn't feel that cold, my glasses began to make cracking sounds as I was walking around town. I suspect that the thermal stresses from the cold made them contract some. At first I thought that I'd broken then, but they seem to be intact. After I'd settled in for a relaxing evening in front of the computer the fire alarm went off. I poked my head out the door to see what was going on and caught the fire captain setting off the alarm. She was wanting to test our evacuation time as well as to see how long it took for the fire department to respond. Had I been working nights I would have been just a little upset as I would have still been fast asleep. But the distraction turned out fine as I was among the first out and the very first to a public computer in the Coffee House. So, I was able to check my mail and what not. When I heard the engine from the fire truck pass the Coffee House about 15 minutes later, myself and about 5 others jumped up, donned our parkas, and returned to our rooms as if nothing happened. Couldn't get any sleep until after midnight once again. I stayed up past my bedtime watching part of "Gladiator". Consequently, it was another tough morning to get up. I was pretty much lethargic most of the morning. But I wasn't alone. There seems to be a lot of that going around. It's like some of us are almost zombie like at times. People stare off into the distance when they eat their meals and become seemingly hypnotized by computer screens. Me, I just can't seem to think straight. I start working on this journal of mine and it takes me an hour sometimes to put together two sentences. I think that we could really use a splash of sunlight in our lives. I celebrated by playing some John Phillip Sousa that I had on my laptop and by going to the "Tatty Flag" bar at Scott Base. We won't be having the official shindig here in McMurdo until Saturday. And since it's coincidentally the first weekend of the month, the station will have the weekend off to celebrate (and recover). Fortunately, so will I. There was an interesting weather map on the McMurdo intranet site today. It shows Ross Island, the icebergs B-15 and C-18, and evidence of what are called "glacial outflows". A glacial outflow is a weather system that brings cold air from the polar plateau to the south of us. Since the plateau is at a much higher elevation and cold air stays low to the ground, you can see evidence of the winds blowing through glacial valleys and onto the Ross Ice Shelf. Gravity causes the winds to speed up as they are channeled through the valleys. Such winds, once they arrive at the coast, are known as katabatic. I've posted a picture here that better illustrates what I'm talking about. The station's celebration of the holiday kicked off the two day weekend. Without a doubt, it was the most organized affair of the season, complete with a parade, dunking booth, carnival games, hamburgers, chili cook off, live music, a jail where the imprisoned had to sign karaoke in order to earn their freedom, and, without any pretense to civility, a belching contest. The creativity of my co-workers amazes me sometimes. The parade, for example, was made composed of two 6 wheelers towing floats of sorts. One one float was a Ski-Doo on a trailer and the other was Ms. McMurdo ala the Statue of Liberty. It was a simple parade, yes, but had the zeal of any large one that I've attended. It was also a rather short affair, lasting long enough for the vehicles to come in one side of the heavy shop and then out the other, stopping only long enough for the garage door to be opened. I was set to take a lot of pictures, but I forget a spare set of batteries. Usually I can grab a couple of dozen pictures with a fresh set, but the batteries in my camera must of have lost their charge over the past few months. So, I only managed to grab a half dozen, and most of those came out blurry. Didn't make an effort to get out of bed until brunch. Since I'd stayed up to after 3:00 AM getting in "just one more" turn of Civilization, it wasn't too difficult to fight off the the bed's efforts to throw me out. Once again, I fixed myself a waffle and stacked on the whipped cream. In case one wonders how easy it is to eat something that thick and "fluffy" with a full beard, well, it isn't. I ended up doing a lot of what we call "filter feeding." Everything was strained through my beard and it required a lot of napkins to clean up. I'm getting kind of tired with my beard, actually. It doesn't annoy me that much, even the "filer feeding" aspect is manageable. I'm simply tired of the look. I'm thinking at WinFly I'll shave it off. Then, I'll confuse the population of McMurodites who will think that I've just flown in. There was a teleconference between the South Pole and Denver at midday, so the internet was shut down for McMurdo for much of the afternoon. Since we share bandwidth with the Pole (for the few hours a day that they have satellite exposure), they needed all of the internet pipe that they could get in order to have the conference. I've not heard the reason for the video conference, but I would guess that it was important. Anyway, no internet gave me a reason to watch TV. So, for two hours I sat through NBC's "Dateline". It wasn't that I have a lot of respect for their infotainment shows, but it was simply something from the outside and I needed some exposure to something new. I might even try to watch TV again provided that something gets my interest enough so that I can sit still. Slept in once again and "filter ate" yet another thick, fluffy waffle. Although they're quite sugary and fattening, I find them much easier to eat than the greasy "normal" breakfast entrees. I didn't really do a whole lot, not even go to the Coffee House. Instead, I stayed in my room and chatted with Ella and played games. Later in in the afternoon I broke down and watched a DVD that I had been saving all winter, Memento. It's an incredibly fascinating study of a man with memory problems trying to solve a crime. I'll not yield more details as I don't want to spoil it for anyone. But it has a lot of things going for it and is definitely worth a rewatch or three. Another non-eventful day at work. The only thing significant that I managed to accomplish was uploading and configuring a chat server to my web site. I've heard some rumors about the powers that be in Denver have decided to undertake bandwidth conservation efforts and that the chat clients (Windows Messenger, Yahoo, and AOL Instant Messenger) will be blocked. It's probably just another Mcrumor, but I'd rather be prepared for it by setting up my own. My chatting sessions with Ella are to important to lose. Went to bed early this evening, like before 7:00 PM and had no problems going right to sleep. Nine months on the ice with just over 3 months left. Only 6 weeks until WinFly and mail, freshies, new blood, and, most importantly, sunrise. I've been negotiating with the fire crew about getting out on the runway in one of their trucks to see the first plane land. If I'm off work that day, I just might be able to pull it off. I suppose that the logical continuation of this entry would be to reflect upon what my time here on the ice and speak of how my outlook on life has been forever altered. But I'm feeling too lazy for that. Some other day. Went to work on another remodeling project this morning. This one is just getting started and should make for a good learning experience. Contacted Raytheon's travel agency in Chch about post contract travel. Also asked them to give me a quote about flying Ella over. I'll hopefully hear back from them in the next day or two. Sat in front of the laptop for over an hour trying to think of anything else to write about but unable to do so. I wonder if perhaps T3 is contagious as it seems to affect me when everyone else has a bout of it. For example, even though there was conversation at the dinner table, my co-workers were pretty much content to keep to themselves and stare away into nothing. And if it's bad here in Mactown, how is it here at the Pole, Palmer, or, heaven forbid, the Russian base at Vostok? Neither of those places have the amenities that we do. At least we some means to remain occupied and keep our minds engaged and at in touch with the world. Spent all evening at Scott Base playing pool and drinking a few beers. Since I didn't have to work tomorrow I stayed up late surfing the internet and caught Ella just before she went to work. She has had cable installed and now has a broadband connection to the Internet. Of course, we also have the dilemma of having to choose between cable or satellite. I like the idea of sticking with both, but am having problems convincing Ella of my point of view. Cable could provide the local channels while the satellite company provides everything else. It will cost a little more than having the cable company's package, but it doesn't leave our eggs in one basket. I never liked the monopoly that the local cable company has and like to keep my options open. Besides, Ella has spent the cash for the satellite equipment. I'd rather keep and get some use out of it rather than throw it away. Saw evidence that the sun exists today. To the north was a deep red/purple horizon. High above, I could see clouds disrupting the hues, as if they were casting a shadow in the sky itself. And to the west, I could make out the faint outline of the Trans-Antarctics. Perhaps next week, after this upcoming rotation, I will be able to head out to Hut Point with my camera and capture some pictures to better illustrate what I'm talking about. Also saw the Search and Rescue team's lights out on the ice shelf. They must have been practicing for one drill or another. They were simply solitary lights several miles out of town lost in a sea of darkness. I couldn't help but be struck at the feeling of isolation that the scene instilled in me. Steaks for dinner. Usually they are hit or miss, but tonight I got lucky and scored a home run. I only had to trim away 1/3 of it. Fairly low fat by our standards. Somewhere on station is a water leak that amounts to 10,000 gallons of water being lost per day. Plumbers went through every dorm today checking for leaky faucets and running toilets to no avail. Three days of searching elsewhere around town hasn't yielded anything either. As far as I know, all of the buildings that had been shut down and boarded up for the winter (about half of the structures in town) have been opened up and went through as well. How can 30,000 gallons of water just disappear without leaving a trace? In this land of 30 below temperatures one would think that it would be quite obvious where the leak is coming from. "It's a mystery, wrapped in a riddle, inside an enigma." Anyway, there are managerial meetings galore and "wanted" posters soliciting help in finding the culprit. Although it doesn't present a threat to our state of hydration (we store around 200,000 gallons in indoor tanks and can produce about 5,000 gallons an hour from our reverse osmosis water plant), the concern is that frozen pipes can cause significant damage. First day back at the plant and the after work choices of entertainment were limited to going to the bar and drinking free beer at someone's birthday party or staying in my room with the computer. My laptop won out. "McMurdo is a drink camp with a working problem." The most humorous, yet sadly insightful comment that I've heard this year. Jimmie, the power plant mechanic, got some bad news today. He will have to leave at WinFly. He injured his shoulder while replacing the cylinder heads on the last engine rebuild. Although they weigh over 200 pounds each, that wasn't the problem as we have hoists for maneuvering those. Instead, he injured it while applying the Herculean torque needed to secure them in place. He initially thought that it was a muscle pull, but had the station doctor check it out after it didn't get any better. Two months later, it's serious enough to warrant him being put on light duty and he will be flown out as soon as the station opens to have a specialist take a better look at it and recommend a course of treatment. Slept in to compensate for getting to bed late again. When I came out for lunch I noticed that they sky was getting lighter to the northeast, so I came out with my camera and tripod to try and get a picture. The only way to capture the moment was with a time exposure. But when I mounted the camera to the tripod and set it to snap a picture, the wind kept blowing the camera around creating a blurry image. It took three tries to get it right and involved moving the tripod and hither and yon trying to get out of the wind while still getting the shot I wanted. Since I hadn't anticipated being out so long I didn't wear any gloves. Big mistake. My hands got cold to the point that it was difficult to manipulate the camera. Even something as simple as turning it on and off proved to be nearly impossible. Another late day in the rack. Couldn't get to sleep last night. I'm curious if this is a station wide phenomena. I also can't help but notice how Spartan this month's journal seems to be. Lot's of short entries and hardly any talk of substance. Same root cause (T3)? Since I noticed that I had clear skies and little wind, I bundled up and went out to Hut Point before lunch in the hopes of obtaining a few good pictures. My trip was a qualified success. After 45 minutes in the cold, I managed to grab only a few pictures that weren't blurry (same problem as before, tripod wouldn't hold the camera stationary when it pointed at an up angle.) And although I wore both mittens and liners this time, I still had to take the mittens off long enough to attach the camera and aim it. Far too long for my liking. And since I couldn't leave the camera outside my parka for more than a few minutes without fear of doing damage to it, I had to repeat the process every time I wanted to relocate and get another shot. When it was all said and done, though, I had one shot that I would call a keeper. For it, I used a 3 second exposure to capture what I thought would be brilliant McMurdo lights from above. Instead, what I got was a ghostly, even surreal look at McMurdo through falling ice crystals. Over the course of those 3 seconds, they fell enough to reflect light around the street lights to make them look like the very fires of hell themselves. The fact that the water vapor was billowing from furnaces added to the the effect by giving the appearance of steam rising from a volcano vent. Ordinarily, those ice crystals are barely visible, and I may have even alluded to them once or twice. But with a long duration exposure, their movement is clearly noticeable. Not exactly a glamour shot, but a bit amusing I think. 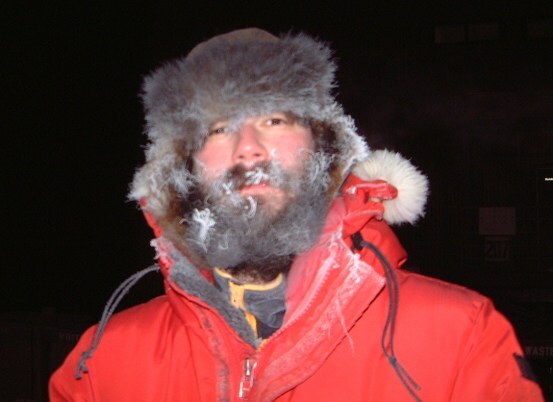 Ice had accumulated in my moustache, beard, the brim of my fur cap, and around my parka collar. What wasn't so funny, or at least at the time, was how hair from my moustache and the area immediately below my lower lip had matted together in a ball of ice. Essentially, it served to weld my mouth shut. It was only after a bit of careful manipulation was I able to get my lips safely apart, and even then it was at the expense of a few hairs. I spent the afternoon helping some electricians install conduit for a fire alarm system at the new Science Support Center that is supposed to be open by WinFly. There's still a lot to be done, though. Over ambitious time table developed by the powers that be? Had an urge to watch "The Truman Show" in the evening and found a copy in the video library. Interesting parallels between my documented life and Truman's. In case I don't see you, good afternoon, good evening, and good night. Towards the end of my shift at the plant I got a most curious email forwarded to me by Don, the boss. There is to be a two hour safety stand down tomorrow in light of an increase in the number of injuries around station. The author makes no qualms with attributing the causes to mid-winter blahs and not paying attention to what we're doing. Guess I'm not the only one with a 1,000 yard stare. Also, I found out more about the water leak. It, or a large portion of it anyway, turned out to be a leaky high flow toilet in a ladies room somewhere. We suspect that it didn't eliminate the problem entirely, but it lowered the loss to enough to where it seems to have fallen back beneath the radar. Sat with Don and the usual dinner clique at the galley after work. I wasn't aware that he had his pilot's license and listened to him talk about the joys of flying. Didn't I once have aspirations of obtaining a pilot's license. Didn't I make mention of that somewhere...like my journal? What happened to that dream? Did it fall my the wayside in light of other things? Was it even serious enough to begin with? What other dreams have I abandoned? Am I doing what I really want to too now? Funny how one random conversation can lead to a whole series of metaphysical questions. But my brain is in no condition to contemplate such matters. It's much to mushy and soft from the absence of whatever the darkness has taken away from my brain chemistry. Instead, I drowned it in a few beers at Scott Base later in the evening. The NSF representative called for an emergency all hands meeting this afternoon. This rarely happens unless there is very important news (i.e., emergency medivac, death, etc.). Don can only recall once in the entire time he's been down when it's happened. Meetings of lesser significance are are called by Raytheon's station representative from time to time, but his authority is superceded by the NSF representative and he has no control over matters that affect the scientific program as a whole. I should also note that the NSF rep, Bill, is a deputized US marshal and serves as our law enforcement, if need be. Since the email was sent out about 2 hours before the meeting was called, a lot of things were going through our minds. Did someone commit some sort of serious crime? Get seriously injured and require evacuation? Raytheon lose the contract? We didn't know at the plant, and neither did anyone around town when we tried to get more info. I was the on-duty plant operator, so I was about the only person in town who did not get to attend the meeting. Even the night shift operators were woken up. When finally the meeting was over and I informed of what the hulabaloo was all about, I was thrown a curve. Instead of a notifying us of a station emergency, as I had anticipated, anthrax has been found at the Terra Nova hut at Cape Evans. Since the hut goes unvisited this time of year and no one infected with the bacteria, the NSF rep called the meeting in order to scoop a press release slated for this weekend. He wanted to reassure everyone so that there was no panic on the part of anyone in the station or families at home if and when the story got picked up by the news outlets once it made the newswire. Anyway, it seems that some soil samples were taken last summer tested positive. The Terra Nova hut was built as a staging point for Robert Falcon Scott's last expedition to the pole and he used Siberian ponies to haul supplies around. Without seeing the press release, I would guess that one or more of these ponies was a carrier for the disease. However, since the ground is frozen and people tend to be very bundled up when they visit, there was little likelihood of anyone catching anthrax over the years. And since the incubation period is 60 days, anyone here contracting it would have already exhibited symptoms since no one has been out there since station close. I've yet to see any long term solutions for ridding the area of anthrax. In the meantime, the powers have decided to lock the hut and not allow anyone to visit it. So, it would appear as though this year was the last opportunity to visit it for a long time to come. I will post a link to the press release as soon as it becomes available. In the meantime, photos of the hut, including the stables, are viewable here. There wasn't as much clamor about the anthrax as I would have thought. It was no big deal to anyone. As well as it shouldn't be. The risk was incredibly low of contracting it. And even if one did, it's not likely to be fatal. It's not in a weapons grade form so as to be readily inhaleable. Instead, once would probably get flu-like symptoms that would clear up after a brief period of time. Besides, no one has been up there in almost 6 months. A few weeks ago, I mentioned that all of McMurdo's bandwidth was reserved for use by the Pole. Today, I found out why. There was a story on the bulletin board about someone at the pole having knee surgery and how there were doctors videoconferencing with the pole doctor throughout the procedure. According to an NSF press release, this was the first time that "telemedicine" has been used to perform a surgical procedure at Admundsen-Scott. Slept in, made myself a waffle for brunch, filter ate it, watch Memento once more, had a burger and bear for dinner. I had an inkling to go outside in the early afternoon and take more pictures but didn't feel like going through the motions of bundling up. It takes too long and it's too cold to be outside for an hour or two. Instead, I opted to remain inside and bask in warmth of the laptop. No press release about the anthrax yet. I've been searching the pages of the university that performed the tests as well as that of the NSF. I figure that it will show up at either of those places before, if ever, it makes the news outlets. It was another day that blends in with the others. So much so that I wonder where my 3 days off went. Of course, for half of two of those days I was at my second "job". And the bulk of my free time was spent sleeping, or trying to. The moon is nearing it's full phase so that might exacerbate the T3 problem. Spent the evening surfing the internet for Land Cruiser parts and watching "The Red Violin". Was a wee bit preoccupied with the movie that I saw last night. "The Red Violin" is an independent film that tells the history of master craftsman's17th century violin as it passes from one owner to the next until present. I'd always had a fascination with history, so much so that is what I finally decided to study at Cornell. But the scholarly pursuit of history has made me a bit jaded on the topic. At least as far as reading is concerned. However, I still like antiques and trinkets that have some historic value. They have a story, much like the violin in the movie. My first brush with with such an artifact occurred when I was about 11 years old. I was searching in a neighbor's garden and found an arrowhead. Not just a piece of broken flint like what my friends had, but a real arrowhead with perfect proportions and intricately crafted jagged barbs on the side. It was unlike any that I'd ever seen before. Over the years I accumulated quite a few. Not having access to an expert, though, I didn't really know much about them other than that they were simply arrowheads. There was an anthropologist at Cornell who was a specialist in Native American artifacts. With a stroke of luck, his subspecialty was Native Americans of Virginia. So, I scheduled an appointment and had him look at what I had. By and large, the average age of the arrowheads was between 2,000-3,000 years. He was able to give an estimate because of carbon dating of fire pits around which arrowheads of that type were found. But he was a bit shocked to see the first arrowhead that I found as it didn't fit the profile of the others. To my surprise, it is much older than the others. Much older. It dates from around 8,000 BC and is technically known as a Clovis point. From what he told me, the reason that it is more intricate than the others is a matter of efficiency. Over the course of thousands of years, the makers realized that their tips didn't need to be as well crafted or "dangerous looking" and that smoother, cleaner lines would serve just as well without all of the time consuming work. In short, they became outdated and replaced with better technology. So, it seems that I have in my possession the work of a skilled craftsman. A piece of art with a story. A few years ago, with the aid of the internet, I was able to get start collecting Roman coins. I'm not a serious collector, I buy only the "uncleaned" coins dug up in hoards in the Balkans and Middle East. They are surprisingly inexpensive and, with a little elbow grease, you can get a get a few interesting finds from time to time. Unlike the Clovis point that was thrown a few times and lost in the soil for a 10,000 years, the coins were circulated and used for quite a while. You can gather this much from the wear on both the writing and faces or tail portraits. Sometimes they've been clipped. People would want to check their authenticity (counterfeiting was rampant, and yes, you can even get hold of forged coins as well) and snip a piece out or punch a hole in the coin. When you buy coins from these lots, they tend to be from the Imperial period before Rome's fall to the Vandals in the fifth (?) century A.D. More specifically, they will be from the 3rd or 4th centuries and will have been minted locally. From time to time, though, one will find a coin from say, minted for the Legion in Spain in the lot leaving you to wonder how it traveled across the Mediterranean. More interesting is the story of how these coins came to be in the ground to begin with. Since there were no banks, people would stash their savings in pottery around their homes. Often, soldiers would drop off their belongings before a battle, only never to return to them. And then still, these hoards are found on sites of long forgotten settlements. Of course, since I'm not the one who dug them up I won't know anything of the environment in which they were found. But there's still something to be told from their markings. Anyway, that's a long winded way to say that I bought something on eBay. The movie got me thinking so I bought a few more coins. I found an auction that was closing in a few hours time and put in the winning bid for 20 coins. I'll have them shipped here and hopefully they will arrive at WinFly. I'll then have a few weeks to clean up and attribute them. Some will probably be left around town for someone in the future to ponder over. Another day of routine. The internet was down for most of the day, though. So it day was more boring than the rest. I know that I once looked forward to routine. My logic was that it makes the time go by faster. And it seems that way....in retrospect. But not when you are living a month of Sundays (or dare I say, Mondays), let alone 6 of them. A fully moonlit day and the last full moon before sunrise. The sky was clear and the ice shelf reflected the moonlight. So, I took a picture of Hut Point with my newly fixed tripod (tightened up a loose allen bolt on the side that caused the camera to pivot up in the slightest wind). The flight schedule for the austral summer has been released. The first 5 flights in October are the ones that I'm most concerned about, however, as one of them will be bringing my replacement. Another one of them will be my bird out. Unfortunately they will all be C-141s, like the plane that I flew down on (with 5 aborted attempts). I had so wanted to leave on one of the newer C-17s (the Cadillac's of military transport). The WinFly bunch will get to fly on them but those of us leaving later will most likely miss out. The university that performed the anthrax test posted a press release today and the BBC picked up on it. They don't say anything more than what we already knew, but it's good to see an official source. There was a "formal" dinner after work. That is to say that the galley was serving a sophisticated dinner and there were people serving wine. Some people even dressed as nicely as they could. Afterwards it was off to the "Tatty Flag" at Scott Base. Most bars that you visit anywhere in the world will have a mixed drink that they call there own, something unique to set them apart. It's no different here in Antarctica. At Scott Base, the Kiwis have developed a concoction known as the "fiddy fiddy", or an alcoholic induced bastardization of "fifty fifty". The name is derived from the ration of the ingredients: 50% Absolut vodka and 50% sweet, highly caffeinated, vitamin heavy energy beverage poured into a cola glass. The end result is essentially 4-5 shots of vodka that tastes like liquefied gummy bears: very smooth, slightly tangy, and moderately syrupy. For the heavy hitters, you can order a fiddy fiddy of the ninety-ten variety. Not only does a fiddy fiddy deal in proportionalities, but delves into probability as well. For instance, after one fiddy fiddy there is a fiddy fiddy chance of experiencing unfavorable after effects. For instance, inexplicably waking up in Lithuania or some such the morning after is not outside the realm of possibility. More commonly, though, people find themselves in the lounge of their dorm around lunch time the next day being rudely woken up by Olena the housekeeper's vacuum. Compassionate mates usually feel obligated to carry the pitiful codger home, and being a bit stupefied themselves, give up as soon as they get through the door and dump the less fortunate off in the lounge. Feeling like taking a gamble, ordered my very first fiddy fiddy and took my chances. I must say that it is truly one potent drink. Not only was I slightly more inebriated than at any other time this year, I was also a very wide awake and animated drunk. The intense caffeine dose was too much for my normally caffeine free body to take (I don't drink coffee or caffeinated soda). I think that I made it back to my room at around two o'clock in the morning. I should mention that the last shuttle back to McMurdo leaves at 10:30. I will have to write the difference off as missing time. While I'm on the topic of alcohol, I feel obligated to mention that there is a difference in the amount of hard liquor poured for a summer shot and a winter shot. During the summertime, a shot is a shot glass full and no more. A winter pour involves the magic word "when". Question to self: am I the same guy that went into the winter concerned about excessive drinking? Unable to go into my other "job" today. Feeling much too blas�. Definitely symptomatic of the "fun" I had last night. Instead, I hung around my room all day until lunch when it was time to go out for something that masqueraded as pizza. The topic around the dinner table was food. RPSC, the acronym for the company that I am contracting for, has taken on a new meaning: Reprocessed Poultry Saves Cash. Chicken was served as the main course for the 27,000th time this winter. Left over loins from earlier in the week were reincarnated as sweet and sour pork. The more positive conversation shifted to the level of activity in the town. It seems as if everyone is starting to come alive. Full moon? Anticipation of sun rise? Mail and fresh faces? Going home? There's certainly an undercurrent of what we dubbed "channel fever" on the submarine. After dinner I opted to go to the green house for the first time this season. I found a hammock and chilled for twenty minutes or so. Two things struck me in a very profound way. One, I don't remember green being so vivid. And two, the scent of fresh vegetables and flowers is overwhelming enough to drive me away. I'm sure that had I been in the world, I wouldn't even smell them. But since I'm sensory deprived, my nose has become a bit sensitive. Also could help buy feel a bit "sticky". The hydroponic system made the humidity in the green house abnormally high. Or at least much higher than the single or low double digits that we experience on a daily basis. Anyway, my clothes began to feel a bit "oily" as they started to take on water. They weren't damp, mind you, just icky. Again, this is probably something that's normal for the outside, But it was like a new experience for me. The long awaited town photo was taken today. But unlike some of the more romantic photos of years past, this one was taken inside the galley. Some crews have theirs' taken outside with the aid of headlamps from heavy equipment. Us, well I guess the organizers didn't feel like taking the time to set it up. And judging from the absence of faces in the picture, some of my co-workers weren't concerned with it either. There is more light in the northeastern sky at midday. Gone are the dark purples and pinks. Now, it's blue. Still not enough light to read by, but it's a sure sign that sunrise is right around the corner. Intermittent internet connectivity today. We has some hardware or line problems in Denver last week, so it could be a continuation of those. But I was able to get check the news sites when it mattered the most and was able to learn that the coal miners trapped in the flooded mine in PA were all safe and accounted for. Being a coal miner at one point in my life, I took a serious interest in the story and followed as closely as I could given the circumstances. I was optimistic that they would found alive given the nature of the coal seam they mined. I believe that in that part of the world the coal seam rolls like hills creating camel backs here and there. Also, they were areas were they would have to cut rock from the top to make a ceiling so that maintenance can be performed, batteries swapped, etc. Put the two together and you have an area that affords them some air pockets and relatively dry areas to retreat. They were also fortunate enough to work in a fairly shallow mine that allowed drilling equipment to reach them. A truly happy ending for a story that made my problems seem trivial. McMurdo is starting to wake up from it's winter's nap. The buildings that have been boarded up, particularly the dorms, will have their furnaces started over the next week. And at the airfield, the TACAN, a navigational device that transmits distance and azimuth to incoming military planes, was supposedly powered up. The airfield generators are having their maintenance finished and I believe that the runway lighting is to be tested soon. We also gotten our roommate assignments and will have to move into new rooms, that is unless you have enough ice time to remain in the room that were assigned for the winter. I am about 5 months too junior to be so fortunate. So, I am moving back to the building where I lived last summer. I don't like the idea of having a roommate after living by myself for nearly six months, but that's the way the program works. T-minus three weeks until we have contact with the world. Made the effort to get out of bed early to help with the Bldg. 165 remodeling project. But when I arrived, I found only an asbestos warning sign and some plastic containment sealing up part of the room where I was to be working. I would hazard a guess and say that someone is removing asbestos (or what could be, I should say) from some pipe lagging. Interesting. It didn't occur to me that the building was *that* old. After a little investigating, I learned that the electrician I was to be helping, Marc, was out sick for the day. My heart wasn't into work anyway, so I went back to my room for some QT with my computer. At the weekly safety meeting Alejandro and I ironed out our work rotation for the shifts just before he leaves on the 27th of next month. We switched shifts 2 and 1/2 months ago under the terms that we would switch back at WinFly and then switch again 3 weeks later. This would basically make working days or nights equitable throughout the winter. Now that he's leaving, the situation has changed. So, I will go to nights during WinFly and revert to days once it's over. A week, then, at most on nights. Alejandro's replacement, Greg, has been down before and supposedly prefers nights. And since I'd like to get a few more apprentice hours with the electrician's under my cap, it works out for me as well. And while I'm on the topic of work days, it would appear that I am off on the 19th, 20th, and 21st. This would give me a good opportunity to get out to the runway and welcome the first plane. I noticed this morning that the approach lights at Pegasus runway have been turned on. In the darkness of even the late morning, it wouldn't be too difficult to confuse it for an unusual constellation low on the horizon. As it stands now not all of the lights have been lit, only the approach lights. In the weeks to come the "constellation" will grow to be almost two miles long, as this particular runway is 10,000 feet in length. I believe that this is the first full season that Pegasus will be in use. It's been under construction for several years, or rather, what would be best described as construction, anyway. Plows and bull dozers have scraped the runway until they have created a almost perfectly flat stretch of ice. Now, it is certified by the USAF to handle wheeled planes like the C-17 and even the C-5 Galaxy (which was flown down on one occasion). The attention to detail has paid off in terms of maintenance. I understand that there is almost no snow congesting the runway. The winds have blown it free of any build-up. One will see this around town as well. No matter how much snow blows around over the winter, there are areas (mostly flat, like the runway) where the wind exposes bare rock and volcanic soil. One of the Mcrumors that I'm hearing is that this year will be the last time that they will be building an ice runway closer to McMurdo (done each year between WinFly in August and mainbody deployments in October). With the opening of Pegasus and a permanent landing strip (which will be operated year round according to yet another rumor), there is no need to build it. There a problem that needs to be addressed, however. Pegasus is about 30 minutes outside town by truck, perhaps 45 by tracked vehicles and cargo haulers. This creates a problem not only in fuel usage or wear and tear on vehicles, but with cargo as well. How could you protect DNF (do not freeze) parcels and the like when they are exposed to the elements (Incidentally, this is precisely why I waited until the middle of the season to order ink for my printer...)? How could they survive such a lengthy trek unharmed? I suppose that they could land planes a Williams field, which is in the direction of Pegasus, but a few miles closer. But the actual details and solutions are well out of my scope. Just something I find interesting and wanted to pass along.